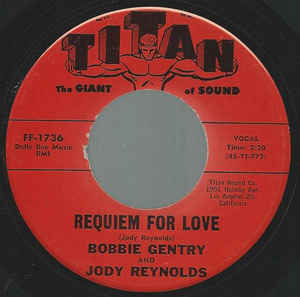 Before the immortal Ode To Billie Joe and a highly succesful showbiz career, Bobbie Gentry sang a couple of duets on a session for Jody Reynolds, he of Endless Sleep fame. When Ode became an unexpected smash, Requiem For Love, a creditable track in Nancy & Lee mode, was reissued, opportunistically with Gentry's name now first on the label. Must have pissed Reynolds off for sure.